This is what I might refer to as a pseudo-dessert. It's not quite sweet enough to be a full-on dessert treat in my humble opinion—oh sorry, I guess we hip blogger-type people are abbreviating that to "IMHO" these days. But anyway, it's not sweet enough for dessert, as I was saying, and it's a little too sweet to be dinner, IMHO. But that's just fine for folks like me, because I just graze all day long. I rarely eat actual meals. I grew up that way. I ate a "meal" with my family exactly three times a year: Easter, Thanksgiving, and Christmas. Other times, my "dinner" usually consisted of a bowl of cereal eaten on the piano bench in the living room, which I straddled like a horse with the food in front of me so I could watch television at the same time. So personally, I don't really mind food that defies categorization. Likewise, this flatbread is about as dinner-like as a bowl of cereal. However, it's a bit more substantial. And it's actually really good. It might work better as an appetizer, now that I think about it. There's not a whole lot of savoriness to it either. It's a very light flavor. 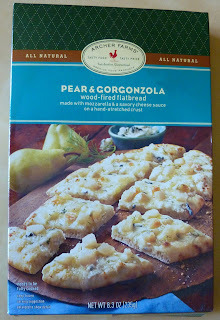 Neither gorgonzola nor pear brings a heavy taste to the table. The bread, as well, has some flavor, but it's not at all overbearing. And because all flavors present are light, they blend together in a really nice way. Baking them all together sort of allows them to gel a little more, too. There's pear juice in the cheese and cheese juice on the pears—and let me state under no uncertain terms that I do NOT think fruit and cheese (like apples and cheese) is a very good combo, personally. But there are a few exceptions, as is the case with certain pizzas. In this case, think of the pineapple on a Hawaiian pizza, but not quite as pungent. So whether you have it for dinner, dessert, or a random snack, there's a good chance it'll hit the spot. It's a unique flavor, and I think it's worth a try.